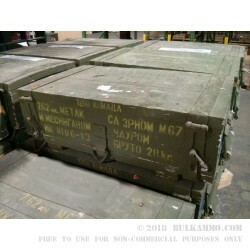 This Yugoslavian Military Surplus Ammo is loaded with a 123 grain FMJ bullet. This ammunition is not attracted to a magnet, but is slightly corrosive, so be sure to clean your rifle after use. Q: Are these loaded with non corrosive powder? A: Hello Nate! This surplus ammunition is loaded with corrosive components but features a non-magnetic bullet. Q: is this ammo non -magnetic ? A: Hello G, This ammunition is brass cased and features a non-magnetic FMJ bullet.